Our DRY-O-TRON DS Series line of dehumidifiers provide the very best in classic compressorized humidity control. The combination of exceptional engineering and design, plus premium components makes our DRY-O-TRON DS Series both energy efficient and exceptionally reliable. 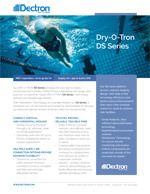 The DRY-O-TRON DS Series provides peak performance in the range of 10 to 100 lbs. per hour of moisture removal and 650 to 8,000 CFM of air handling. Although our DRY-O-TRON Series actually extends up to 1000 lbs. of moisture removal and 70,000 CFM of air handling, for larger applications requiring large refrigerant charges, our DRY-O-TRON DS Series has taken over as the preferred solution. We break the line into three size categories, with each category providing design innovations, standard features and unique features that competitors don't provide. From homes and spas to hotels, schools and YMCAs, our DRY-O-TRON DS Series offers fully featured solutions with plenty of options. Our DRY-O-TRON DS Series is also designed to integrate with and provide maximum performance benefits with the chloramine removal system.